A few months ago, we ran a poll asking our audience if they believe that the site of a site matters when it comes to ranking in Google. In short, do larger sites rank better than smaller sites? After almost 400 responses, I wanted to share the results. Overall, 57% said that larger sites do rank better in Google. 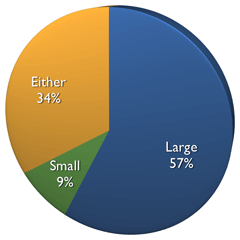 Only 9% said that smaller sites rank better in Google. While, 34% said that site size has no impact on Google rankings. Honestly, I am upset that 34% isn't more like 65% and that 57% isn't more like 15% or so. But I am not surprised by the results.